Will You Ask Your Man To Get A 'Brozilian' For Valentine's Day? It's exactly what you think it is! In the spirit of fairness and equality, our friends at BareSkin Waxing Studio have set up a challenge for men to experience what “beauty is pain” really means. It’s called the Brozilian Challenge—and it is exactly what you think it is. The mechanics are super easy. 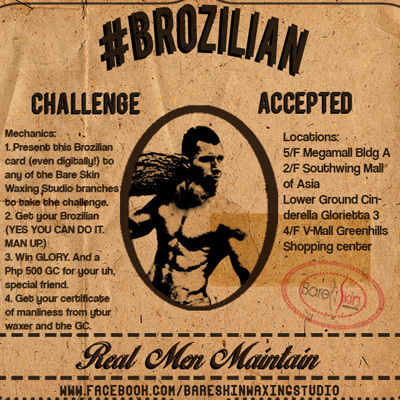 Bring your man to any BareSkin Waxing Studio branch, show the Brozilian challenge card (in digital or in print form), pay for the session, and hold his hand while he gets it all waxed off! In return, he’ll get a certificate (an actual one, we’re not kidding), solid bragging rights (if he does plan to tell the world), while you get a 500-peso gift certificate. Everybody wins! The Brozilian challenge starts this week—just in time for V-Day—until the end of March, so you better get your man ready for it. What do you think CGs? Will you drag your boyfriend to this?